#ALDUBSwitch The ALDUB Switch episode reveals what happened to Donya Tidora. Too bad she failed to make it at the ALDUB Meets TVJ episode. (Relive the ALDUB Meets TVJ in this gallery.) She missed her flight. In a desperate attempt to get to the Eat Bulaga studio. She tried swimming from Cebu to the Manila Bay. And she reached Donya Tinidora’s spot by foot. It worsened her appearance. And she ended up looking worse than Donya Tinidora’s army of zombies. The Cuando Cuando Cuando. Donya Tinidora, on the other hand, suffered from a sprained foot. She enjoyed dancing at the Eat Bulaga studio a little too much. And ended up falling from a chair. Still, her experience trumps that of Donya Tidora’s facial disaster. She got into all that pollution for nothing. Donya Tinidora admitted that the pain reached up to her pelvic bone. And it turned out to be worth it as shown in the ALDUB Switch episode. Lola Nidora even mentioned Rihanna’s attitude towards her new found love life. “Nag-hi lang si Harry, sila na. Nag-aya lang ng date si Harry, magpapakasal na raw sila.” (Harry just said hi. And they’re already a couple. Harry just invited her out on a date. She said that they are getting married.) In between the conversation, Lola Nidora tried some DUBsmash too at the ALDUB Switch episode. Soon everyone was looking for Alden. Lola Nidora had positive feedback to share about Alden’s choice to serve them. “Maayos si Alden. Seryoso sa paninilbihan sa akin.” (Alden is fine. He is serious in serving me.) Soon enough, Alden arrived aboard a tricycle. Seems like only the main Rogelio Rogelio Rogelio are allowed on Lola Nidora’s car. That is despite wearing the Rogelio’s barong uniform as well. The ALDUB Switch was evident once Alden was seen in that blue barong. As Alden appeared on the barangay post where the De Explorer triplets sat. YayaDUB appeared on the other monitor. She sat on the same spot where Alden sat months ago when she first smiled at her. She’s not wearing her apron at the Broadway Centrum. It’s like a day-off. The ALDUB Switch episode showed the switch in monitors used. The ALDUB Switch also demonstrated the switch in duties. Alden ended up taking on the cudgels for YayaDUB. Surely, Lola Nidora’s medication is supposed to be over. But she ate chicharon at the ALDUB Meets TVJ. Who knows how much pork cracklings she ate for that day? It might have triggered her ailments anew. So while YayaDUB was away. Alden was the one handing Lola Nidora her maintenance medication. Alden even had a ready glass of water in case Lola Nidora chokes. Alden did not have a folding fan like YayaDUB. But he carried a mini electric fan. There must have been an electric outlet close by. (And maybe Alden is not that much of a fan of folding fans.) Bossing Vic noticed how weak the mini electric fan is. As he starts getting comfortable with his role as temporary Rogelio. Alden DUBsmashes Blue’s “Best in Me”. YayaDUB has transferred to Alden’s den. Another visible sign of the ALDUB Switch. Donya Tidora tried to warn YayaDUB of the circuits at Alden’s den (in case there are any). The den is close to the props’ room. So cables might get her “grounded”. Alden ended up with the longer DUBsmash hits. YayaDUB ended up with her DUBsmash hits cut short. Alden managed to DUBsmash Side A’s “Forevermore”, 98 Degrees “I Do (Cherish You)” and A1’s “Like A Rose”. And YayaDUB seemed prettier at the studio. The ALDUB Switch must have had that positive effect on her. The ALDUB Switch episode also revealed YayaDUB’s companion at Alden’s den. It was Ryzza Mae Dizon. YayaDUB introduced her as YayaLUVS to the De Explorer triplets. And she can also do DUBsmash. For now she can do the Minions’ Banana Song. She even DUBsmashed Cherie Gil’s killer line from the film “Bituing Walang NIngning” (Star Without Sparkle). “You’re nothing but a second-rate trying hard copycat!” KalyeSerye commentator Bossing Vic Sotto thought her name was YayaTABS. (Short for Yaya Taba or Fat Nanny). Donya Tinidora thought it sounded like a laxative. YayaDUB missed the pabebe moments that she had with Lola Nidora. So a pabebe DUBsmash was underway. The KalyeSerye commentators would have wanted Alden to do the pabebe DUBsmash too. But then he talked. “Puede kanta na lang?” (May I just sing instead?) His request led to another ALDUB duet in the ALDUB Switch episode. Even YayaLUVS can’t help but feel giddy at that sight. Donya Tidora asked Lola Nidora. 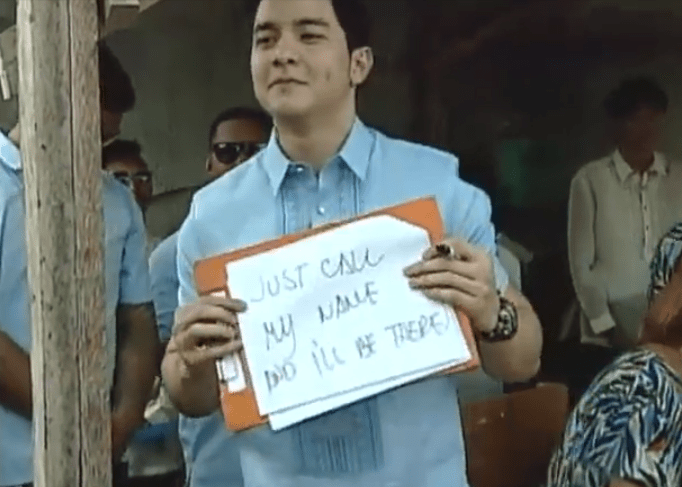 “Dito muna si Alden?” (Alden stays here for the meantime?) Lola Nidora sensed the suppressed giddyness on Donya Tidora’s part. “Ba’t tuwang tuwa ka, Tidora? Iniisip ko pa.” (How come you’re so happy, Tidora? I’m still thinking about it.) Lola Nidora can’t make up her mind that quickly. She ended up accidentally stepping on dog poo. That was a stinky twist for the ALDUB Switch episode. Bossing Vic was vocally pleased with Alden’s immersion at the ALDUB Switch episode. And he is a quick study to learning Donya Tinidora’s hosting antics. He was concerned about a few things though. “Alam mo disenteng tao itong si Alden eh. Isang linggo lang sa kanila, bibigay na rin ito eh.” (You know that Alden is a decent man. He might give in to them after a week.) Donya Tinidora entertained the idea. “Malay nyo, maging 4 kaming ganito.” (Who knows if we end up becoming four.) Quell ideas of an ALDENIDORA Twist for now, please. Lola Nidora liked Alden’s service too. “Dapat sa isang lalaki naiintindihan ang babae.” (It is a must for a man to understand a woman.) The ALDUB Switch episode served its purpose well. But Lola Nidora can’t help but express her bitterness. She still felt bad about losing to Alden to a rock paper scissors game towards YayaDUB’s heart. So she challenged YayaDUB instead in hopes of winning the game again. If she lost, she would let Alden join YayaDUB at the studio. YayaDUB lost to Lola Nidora. The ALDUB Switch episode win served as an opportunity for her to decide who goes to the studio and who goes with her. Before she could even decide which among Alden and YayaDUB gets to join her on the road, the truck horn honked. Check out the ALDUB Switch episode replay at Eat Bulaga’s official Facebook page for more details. Lola Nidora’s mind games are back. And I don’t see myself slowing down on my critiques when it comes to her. And other critiques worth throwing Eat Bulaga’s way. They should really bring back the “bahay” aspect of the Sugod Bahay segment. It helps the segment retain its spontaneity. All these and more on the upcoming episode recaps here at The Philippines Web. Like our official Facebook page, The Philippines Web. And follow us on Twitter @pinasamazing for comments and feedback. We’d be expecting you.